Confessions of a Ribbon Addict: Another one for the "set"
Another one for the "set"
A funny story about Bailey: a couple days ago she made a card. It was heart alphabet stamps on glossy white card stock and she had blurred her stamping a bit. To cover it up, she drew around each heart with a marker. She came to me and asked me if her card was nice. Of course I told her it was. She looked at me, squinted her eyes and said, "MOM, you KNOW this card is ugly!! Why did you say it was nice, MOM this card is NOT nice. I am throwing it away!" LOL She is very hard on herself when she stamps. I am proud of her for her quality control. LOL Silly girl! I am totally a set stamper also!! I stamp about 5-7 cards in the same color scheme! Your card is gorgeous, as are the kiddos!! What a beautiful b-day card!!!! 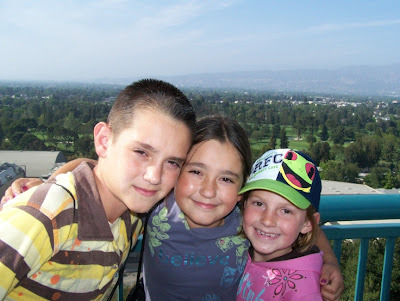 Love the pic of the kids, they are just adorable! Happy Birthday to Bailey, hope she loved the card. It is a GREAT birthday card. ahhhhh love the picture of your cutie pie's! They are getting so grown up looking to me! Love Bailey's birthday card too! You have trained her well....future stamping star! So cute!! Happy Birthday, Bailey! I'm sure she'll love this! 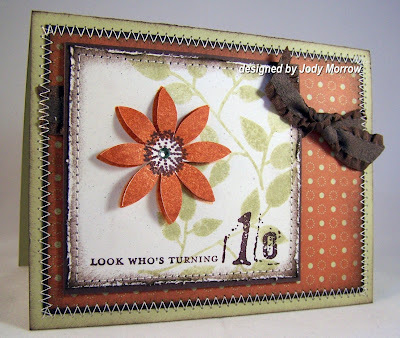 Wow, just love this card...especially the flower and how you have it popping off the page. Okay, well not popping...let's just say it looks like it is growing off the card. Silly sounding I know...but it does look like it did. Okay, enough rambling from me...tata for now :)! Love that story about your daughter; sounds like she's a pro already!